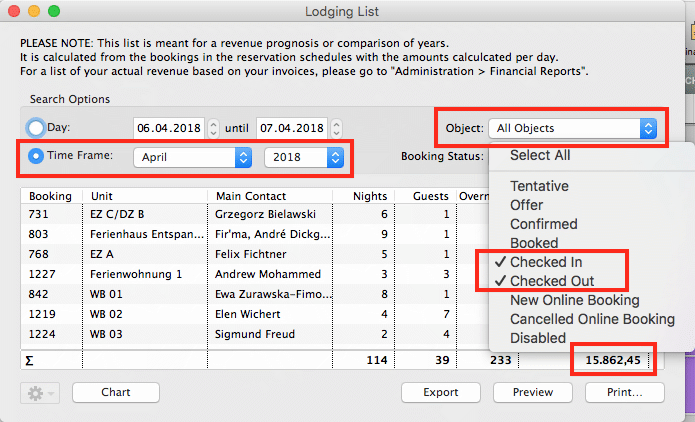 As an accommodation establishment in Switzerland, you must complete a monthly accommodation statistics form, the so-called HESTA form, and send it to the Federal Statistical Office (BFS). Arrivals and overnight stays can be found in the country report. Please go to>Lists>Accommodation Statistics. 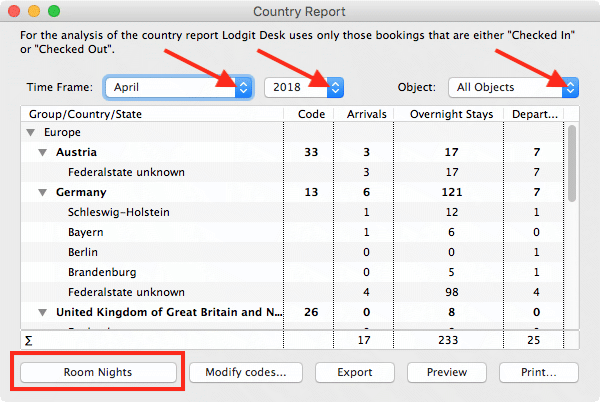 In the Accommodation Statistics window, select the desired period (usually the previous month of the current year) on the left and the desired object(s) on the right. Arrivals, overnight stays and departures are displayed sorted by country and their respective sums at the bottom. The sum corresponds to the total of the HESTA form. Please enter the appropriate numbers in the HESTA form. Now click on the button "Room Nights" at the bottom left. The "Occupancy and Performance Indicators" window for the same period appears. Please select your property(s) at the top right and the booking status below. For booking statuses, you should only check the "checked in" and "checked out" statuses so that you can enter the correct data. In the column "nights*rental units" you will find the so-called "room nights" or the number of occupied rooms or camping sites (monthly total). Please enter this value in your HESTA form. To calculate the average income per person per night (without breakfast), you need the accommodation sales for the corresponding month. You can find it under>Lists>Lodging-List. This list is based on all bookings in the occupancy plan, whereby sales are calculated on a daily basis. 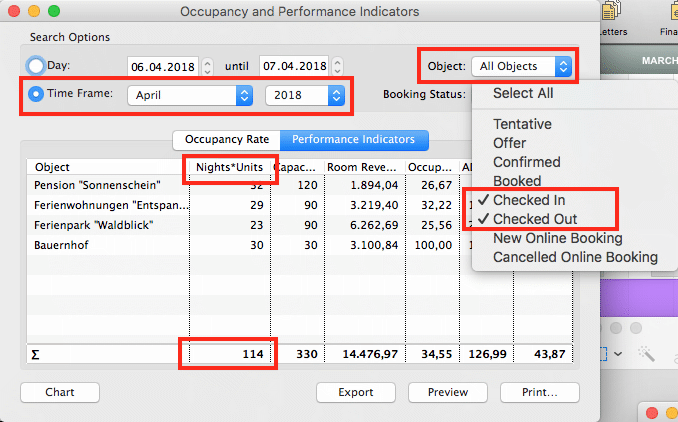 Please select the appropriate period from the list of accommodation, your object(s) in the top right-hand corner and again the statuses "Checked in" and "Checked out". In the column on the far right you will find the daily turnover of your bookings entered in Lodgit Desk. You now have all the data and can calculate the average income per person per night according to the calculation formula and then enter it in the HESTA form. >> Which POS systems are compatible with the Lodgit interface?